At the recent 2017 Addy Awards, Blue C was proud to accept 3 prestigious awards for our work on campaigns across various categories. For 2017, the event was held at the beautiful Balboa Bay Resort, with picturesque views of the iconic Newport Bay. Attended by the movers and shakers of the OC-based advertising industry, the event is a great opportunity to witness and honor the groundbreaking work that continues to come from agencies and marketers right in our own backyard. For this year’s event, Blue C was selected for a Gold Addy in the “Out-of-Home & Ambient Media” category for our work on the Matt Harris Bonneville Campaign. This campaign was the culmination of our team’s creative vision for this exciting debut of Matt’s 1923 Harley-Davidson at the Bonneville Salt Flat race in Utah. Blue C was also the recipient for a Silver Addy in the “Print Advertising – Magazine Advertising Campaign” for the Red Kap Brand Ambassador campaign. This campaign including brand ambassadors was a completely new direction for our client Red Kap and the Addy mirrors the success that the campaign has experienced. 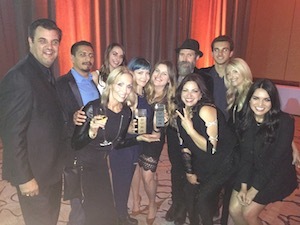 Lastly, we were honored to receive a Bronze Addy in the “Film, Video, & Sound – Branded Content & Entertainment, more than 60 Seconds” category for our work on the Race of Gentleman video, highlighting a truly unique automotive and motorcycling event that garnered significant social media and web attention.